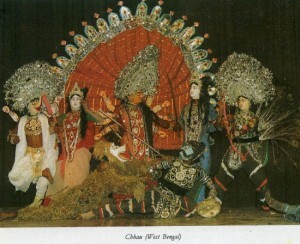 In Manipur a fascinating dance called Paos Jagoi is performed. It is associated with an equally fascinating Meitei (Manipuri language and its old culture) myth which is as follows : God Atinga Shidaba had three sons; Amiba, Ashiba, and Achiba. He asked his sons to create the Universe. When Amiba began the creation, Ashiba destroyed it, not once but thrice. God Shidaba thought that unless he creates someone who can help Amiba, the creation of the Universe will never be complete. Therefore, he created Nogthangleima, a beautiful girl from his eyes and advised her to help Amiba. When Ashiba, who is also known as Pakhangba, saw the beautiful girl, he changed his destructive attitude and wanted to marry Nongthanleima. She spurned the advances of Ashiba and cooperated with Amiba to complete the creation of the Universe. God Shidaba was very pleased to see the beautiful Universe and granted a boon to both of them to be born as lovers generation after generation. Amiba was born as Ningthou and Nongthangleima as Panthoibi. As ordained by God Shidaba, she came searching for Ningthou. When the two met they remebered the sweet days they had while creating the Universe. They were so overjoyed to be once again together that they started dancing which was called Paos Jagoi. The dance is performed to perpetuate the love of Ningthou and Panthoibi. While dancing the male and the female dancers exchange loving words through singing. The dancers wear gorgeous costumes which are prescribed for the dance. The accompanying music is provided by Pung the drum with two faces; Pena, a simple bowed string instrument, Banshi, bamboo flute; Senbung, a large gong; and Taal, the cymbals. In Tamil Nadu Puliyattam is prevalent which has the overtone of theatricality. Pull means a tiger, and Attam means dance. Puliyattam (tiger-dance) is performed mainly in the districts of Madurai, Ramanathapuram and Tirunelveli. Men of usually good build, wearing mask and painting their entire body with dots and stripes, appeal as tigers in human form. A powerful drum music is the only accompaniment with the dance. Some of the dance movements are inspired by those of tigers. The Puliyattam is performed usually at village festivals. In Sikkim the interesting dance called Singhi Chham is performed. It has also religious associations. Mount Khang-chen-Dzong-pa (Kanchenjungha) the third largest mountain in the world is sacred to the people of Sikkim as their guardian deity. As decreed by Guru Rimpche (Guru Padmasambhava), this majestic mountain stands guard over the land, holding within its crevices the sacred Five Treasures. Its associate peaks look like the legendary Snow lion, fierce and fiery with its gorgeous mane hued in turquoise. 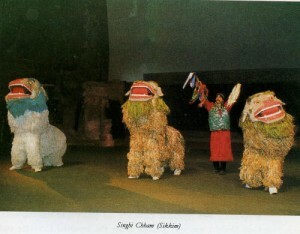 The Snow Lion is considered an important cultural symbol of the state and is elaborately depicted in the Singhi Chham or the Snow Lion dance. Usually two or four dummy lions perform the dance. Each dummy Snow Lion is made of white fur and the face is bluish. Actually, it is total mask made of cloth and fur. Two dancers get into each lion mask and position themselves inside the mask in such a way that the Snow Lion looks somewhat like a real lion. The legs of the dancer positioned on the front become the two forelegs of the lion and the two legs of the dancer positioned at the back form the hind legs. With amazing synchronization the two dancers move so that the movement of the Snow Lion appears realistic. Only a drum is used with the dance. Another entertaining dance of Maharashtra, with dominating theatrical elements, is Vaglya-Murali. This dance too has religious associations. The dance recapitulates the tradition of Marathas to worship the weapons on the eve of Dussera festival, in the name of Lord Malhari, who is considered to be an aspect of Lord Shiva. The name of the dance is derived from the terms Vaghya, the male actor-dancers and Murali, the female dancers who used to be dedicated to Lord Shiva in the past. A duet between the Vaghya and the Murali develops into a full fledged dance to the accompaniment of percussion instruments and bells.